A couple of kilometres from Thones is a turn up a very steep, quiet road to the little-known Col de Plan Bois (not in my cycling bible). 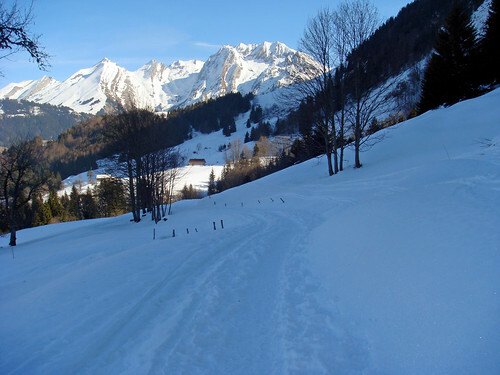 Surrounded by high Alps, the views are amazing. It averages 10% for about 6 kilometres (4 miles) – and is extremely steep in stretches. I was riding my hybrid bike in case of ice. And was soon glad I did. At the top, the other side was under a foot of snow. So I jogged for about a kilometre downhill until finding a cleared road. 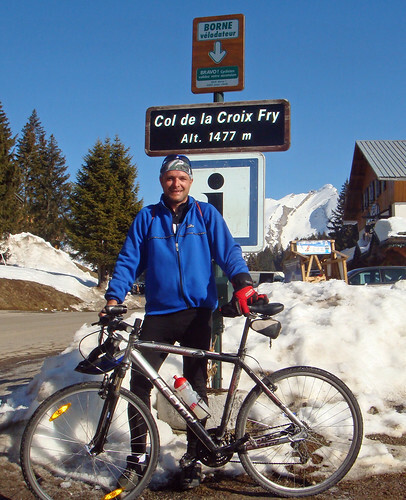 A hair-raising decent and then the route joins the classic way up Col de la Croix Fry below Manigod. 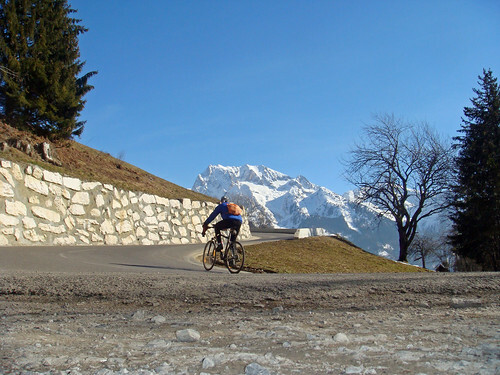 This part of the route had a few cars as there is a ski station at the top – but just a superb climb. 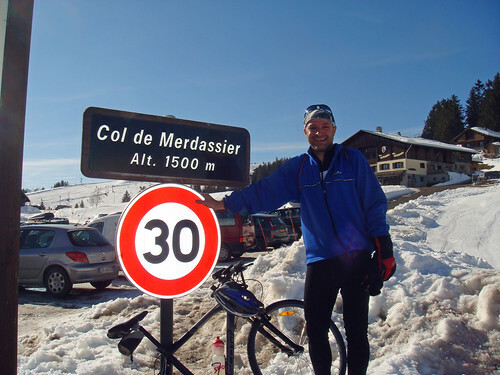 At the very top is quick 10 minute detour to the Col de Merdassier. Enlarge the middle thumbnail photo above. On the top of the sign is a borne velodateur. Basically, you can stamp a time card (from the tourist office well below in Thones) when you reach the top – after stamping it at the bottom – to record you time and route completion. I thought the below photo was pretty clever given that I was on my own! I have a new video cam. No idea yet how to properly/interestingly use it – but here is a small clip. I sit here watching it snow and looking at your photos of clear sunny skies and dry roads in the mountains. You are making winter very hard on me! Great scouting… you should really compile a book or something. Well, a blogs better.. 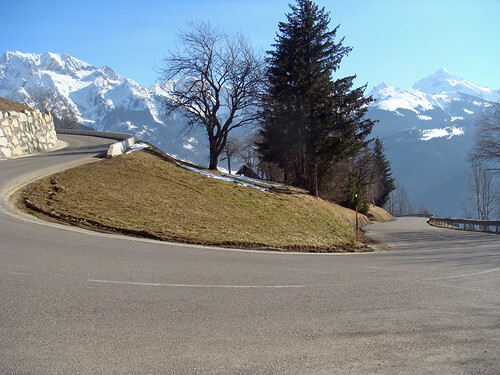 I saw that stage in 2004 on Col de la Forclaz (2nd last climb). It was a serious heat wave and the suffering was amazing. It took absolutely ages for everyone to pass with many getting a “helping hand” from the fans. Video is very cool. Just did this climb last week while on vacation and the views on the way up are beautiful – if you can lift your head up long enough to enjoy them! je connais bien cette région et c’est joli. 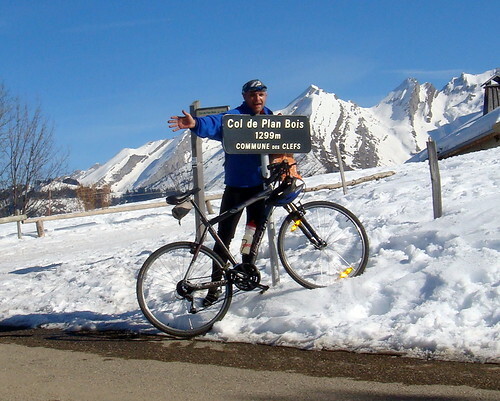 Par le col de Plan Bois c’est effectivement autre chose car il est dure. 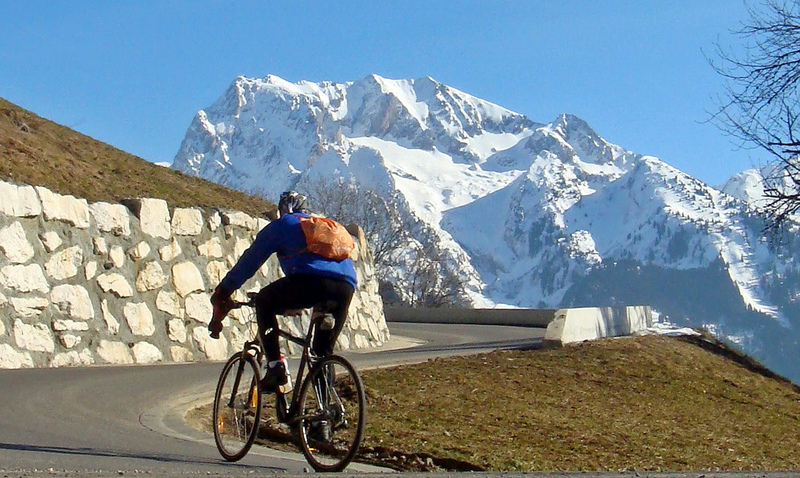 en plus, en VTT… par contre, le col du merdassier, c’est juste pour ajouter une ligne à ta collection ? que penses-tu de la “future” victoire de Contador et de son attitude lors de l’incident de Schleck ? Oui, je suis d’accord. Plan-Bois n’est pas facile.